Jake's is great for people watching, and some times the staff is entertaining to watch, however we have no paid live entertainment! Come check out our new modern cocktails and great dinner specials. Catering is offered on an event by event basis. Please call the restaurant directly for more information. 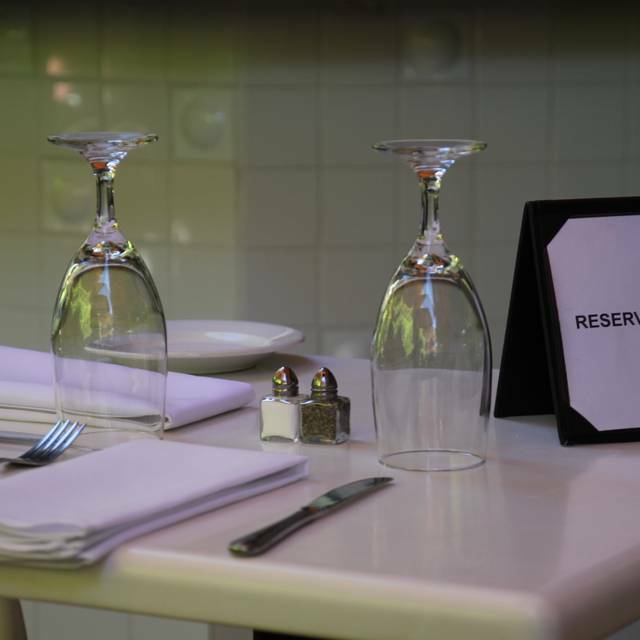 VOTED TOP 100 OUTDOOR DINING RESTAURANT IN USA BY OPEN TABLE USERS! I hope Jake’s never loses its intimate feeling. We went for our anniversary and their attention to detail and awareness that this was a special occasion made it an incredible experience. We come back time after time because they are so nice and accommodating. The food was delicious and we will be back! We had one night in Palm Springs and wanted to eat outside and the reviews / pictures looked nice. The ambience is nice and it was a beautiful evening. The waiters were very friendly. We ordered a couple of items for the family. When the starter arrived I knew that the restaurant pretended to be more cooking wise than it actually is. The fact my salad came out so quick had me puzzled but I could tell the salad had been prepared in advance with ready cut items that did not look the freshest. For example, the shaved parmesan was pre shaved and probably bought like that as it was chewy and dry. I find that unacceptable for a restaurant like this. The salad was very unimaginative. The mains we ordered were good. They were more like home style food with that same look. If you go in with this expectation you will be perfectly ok as the ambience is nice and sitting outside on a beautiful evening makes up for a lot. It is however in my opinion not a higher end restaurant as it pretends to be. It was excellent. Server was very friendly and consistently asked how we were doing but without being a nuisance. Food was excellent. The only issue which was minor was as the restaurant got crowded the noise level increased. That was primarily due to a group of women who were talking way too loud. We were getting ready to leave so we didn’t complain. 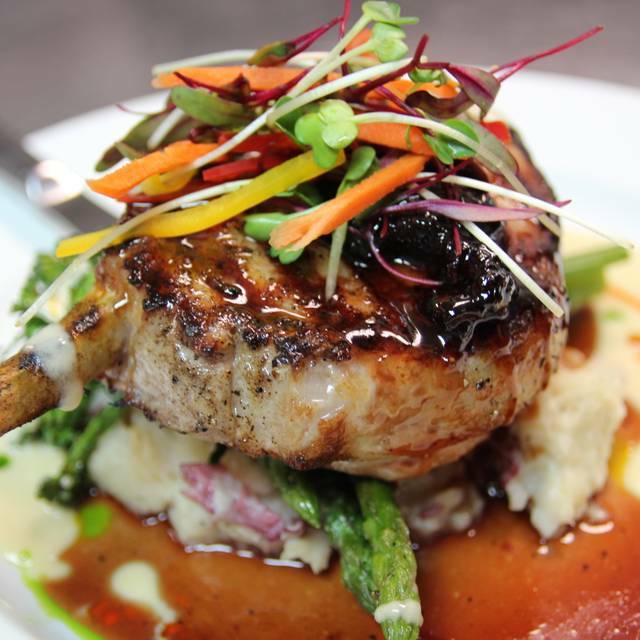 Jake's always has great innovative entrees, and the care of the staff adds to the pleasure of being there. Always excellent food, friendly help and a nice relaxing environment. The wait staff & busses are trained very well. Engaging with the diners too. Service was not good this particular time. The older male host with glasses needs retraining. Poor attitude and extremely rude to us. He told us that he couldn’t seat us outside because he had to prioritize his reservations that were made before “today”. Understandable but the delivery of the message (rude) turned us off. We won’t be back. My recommendations is to provide customer service training to retain customers. Food is amazing as always and I always recommend Jakes to out of town guests. However, for the first time we had one of the worst waitresses ever. Never checked on us, and never was attentive. She was to engrossed talking to her friends at the table next to us that a bus boy and another waitress felt bad and came over. Even standing and chatting with the table next to us she never turned around. Jake noticed and came over. I loved everything about this restaurant. It’s small and quaint, upscale without fancy. The service was fantastic from the moment we stepped in. Everyone was so friendly! The food was incredible, everything tasted fresh and flavor profiles were unique..DELICIOUS! Seriously, this restaurant is on top of my list of “favorite dining experiences ever”. Thank you Jakes! Very attentive and enthusiastic service. Food was great. Steak AuPoivre was a little tough but the rest of the dinner was good enough to have me overlook it. 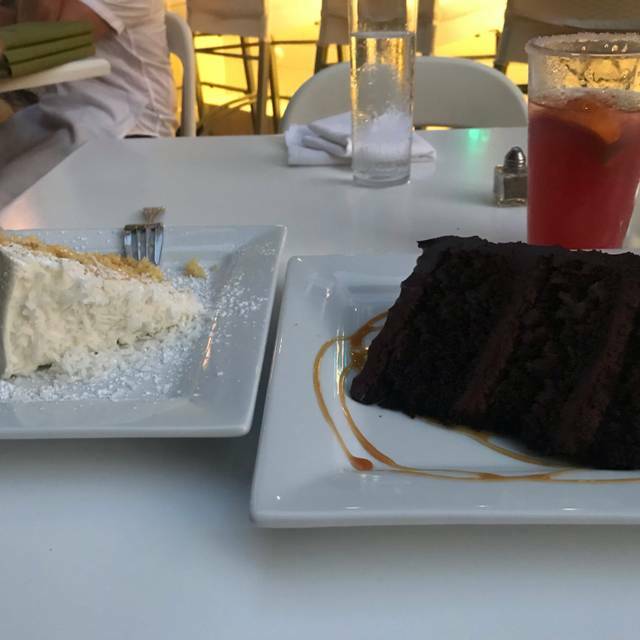 Nice casual, reasonably priced restaurant right in downtown Palm Springs, indoor outdoor seating, nice dinner deal 3 courses to choose from, and PLEASE leave room for Dessert, cause they are absolutely huge and awesome. Will be back very soon. Food was fine: I had the watermelon gazpacho (very unusual, and very good), my wife and I both had the red endive salad (also unusual, but a small portion), I then had the porkchop, which was hard to cut, but not difficult to chew (maybe dull knife? ), my wife had the veal piccata, which she pronounced to be very good. Two glasses of red zinfandel which were nice, but not out of the ordinary. Service was good. Price-wise, about what I would expect of a better Palm Springs restaurant. Felt a bit crowded together and uncomfortable at a table for two outdoors, and the noise level from people talking was very high. Probably won't go there again. 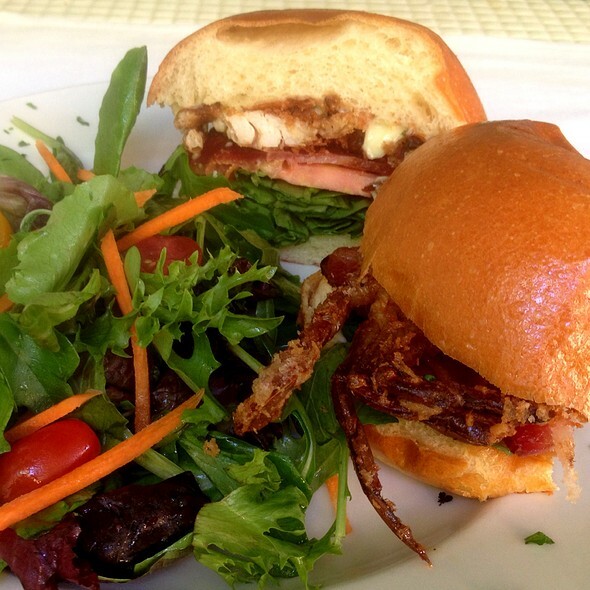 Great lunch menu selection, many high quality choices. Small, intimate patio space, enough shade to cover us on a warm, sunny day. We will return soon. Meatloaf w/truffle mac and cheese; both off the charts good! Loved the food, and the service. The deserts are amazing if you like cakes/pies…. Everything made on the premises …. absolutely delish layer cakes in every flavor and color …. I was too full to eat desert after dinner, but it sure tasted good after midnight! I took mine home!!!! Yummy! 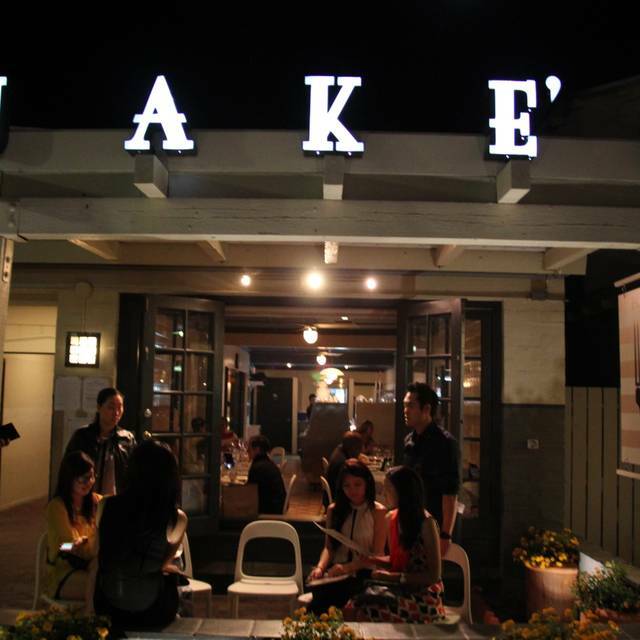 The food and service at Jake’s was very good. My drink was especially delicious. However, we were there for a special occasion which I typed in the field when I made my reservation. There was no mention of it or a special dessert. This is the second time in 2 days this has happened. So either the restaurants don’t pay attention or it’s not clear in open table when the reservation is made. Either way, it was pretty disappointing. Can never say enough about this go to restaurant in Palm Springs.......love it! Excellent food in an open setting well served in a prompt manner. Well priced wine list parking a challenge. It was lovely as always. Thank you. Always a pleasure! 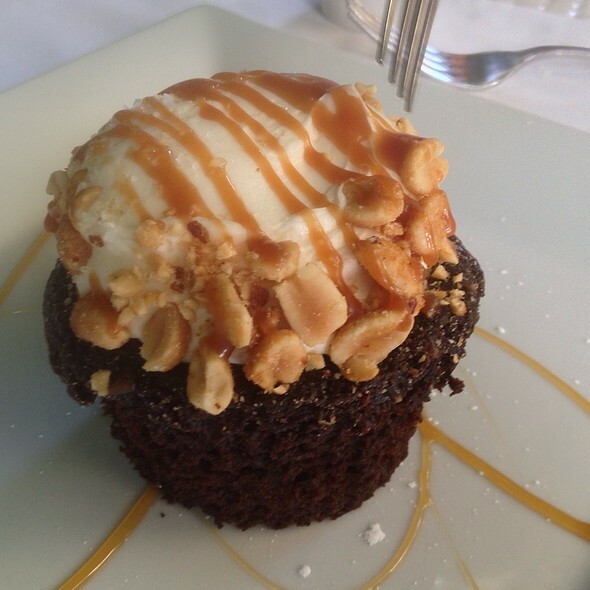 We enjoy dining at Jakes as it is consistently excellent. It has a lovely ambiance, very good food and excellent service. We celebrated our anniversary there last Sunday and were not disappointed. In particular, we love the garden space, the excellent Mediterranean-inspired food, and the delicious cakes. Highly recommended. Pleasant setting, good service, good food, low-key but also nice. FANTASTIC, always fantastic. Food, service and atmosphere is great. I love Jake's, one of my favorite restaurants in town. Great food, great service. So much going for it. 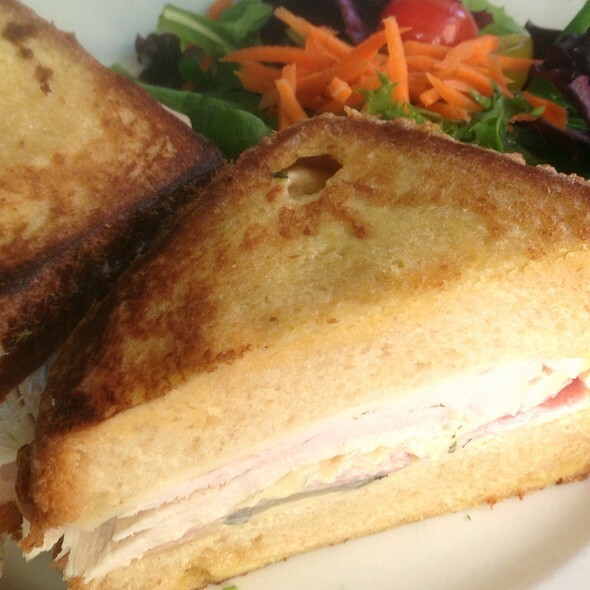 An institution with great service, outstanding food, and a discerning crowd. The only thing it hasn't got is the outrageous prices! We were seated a little late for our reservation. Otherwise, all was good! Always love Jake’s for lunch! All four of us loved our meals and the pitcher of sangria! Our servers were excellent!! the food is delicious. mark is my favorite waiter. Great food but not great seating. Good aervice but hostess wouldnt let us change seats. Food and service not up to par. Celebrating our move to Palm Springs.